It is the digital age, and most of us have developed the habit of communicating through texts and typed messages! Isn’t it? But this does not means that you will never fall in need of using the conventional method of writing on a piece of paper, and if this is it, then you must possess a good handwriting. This lands us directly to the question – Why Good Handwriting is Important? A good handwriting supports reading fluency as it delivers clear visual perception of alphabets. A good handwriting always brings appreciation and if you are a student, then it can even help to score good grades. Most importantly, writing is an integral part of our daily lives. So, whether you are a student or an adult, if you want to improve your handwriting then glance at the top-notch ways to do it! How to Improve Your Handwriting? The very first step towards improving your handwriting is to first begin with analyzing your writing. For this, you may select any topic of your choice and then begin writing a paragraph or at least 5 lines about it. No need to be highly creative in this context, as this is to test your writing skills and not your creativity. Hence, if you do not remember any such lines then you can simply jot down few lines from any book or from the internet. Try writing at least 5 sentences as this will help in doing a better analysis of your writing. Is your writing full of straight lines, or it includes lots of curves and loops? Does your writing appear stiff or does it appear smooth and flowing? If your writing has smooth, curvy ends then this means that it is above average, but if your handwriting has lots of straight ends then this means that your letters does not blend well with each other. Hence, you need to analyze your handwriting properly and if the letters are not blending with each other then you require lots of practice. The angle at which you write down the letters creates a huge difference to how your handwriting appears. A perfect angle can make or break the handwriting. So, whether your handwriting is perpendicular to the lines or it lacks a proper alignment or is slightly slanted. Check for the way the writing falls on the paper. While slanting handwriting is not a major problem, but if it slants too much then this makes the handwriting extremely difficult to read. Also, a perfectly perpendicular writing may sometimes appear unattractive, especially if you are writing in simple fonts. Hence, pick an appropriate angle for your writing, which is just slightly slanting. Do your words fall at an upward angle or at a downward angle? Do your words overlap with each other or the line on the page? If you want to improve your handwriting, then it is essential that the letters do not overlap on each other or on the lines. It is important that you jot down letters in a format that each of them has its individual appearance. A good handwriting is one where each letter has the same direction and the words do not overlap the lines. It is essential for handwriting to have appropriate distance between letters and words. This determines the quality of your handwriting. An appropriate space is one that allows filling the alphabet ‘O’ between each letter. If space is more or less than this, then this indicates poor handwriting. So, when you are jotting down the letters and sentences, make sure you pay attention to the space between each individual letter. Cramped letters or writing is very difficult to read and symbolize that your writing is not correctly placed. The size of each letter you are making creates a huge difference to how your writing will appear to others. Does your writing fills the space well enough between the two lines, or does it crosses the boundaries, or does it crosses one of the lines between the two? You need to have a clear idea about this and make sure that your writing lies exactly between the two lines. If this is not the case, then definitely you need lots of practice to get that perfection and a handwriting that neither consumes too less or too much space. By following the aforementioned steps, you must have got a clear idea of how your handwriting appears and what all flaws it has. The very first step towards improving your handwriting is to pick a writing style that you want to adopt or you adore. There are numerous websites that showcase various handwritings. You can select any one according to your preference and check for few samples related to the same. Also, you can select distinct styles of different handwritings so that you can plan your own unique writing style. While you select the various aspects, make sure you adopt one that is absolutely new and easy to practice on the initial basis. You might be surprised to know this, but if you want to improvise on your writing, then practice writing in the air. Avoid writing with just your hands and make sure muscles from your chest, arm, back, and shoulder are involved and moving while you write. For this, the simplest thing is to jot down the sentences using one finger of your arm and then writing them in the air. This will force your shoulder and arm muscles to swing in that direction and will help writing in a better way when you are writing on a paper. If you want each letter of your writing to fall perfect, then you must select availing a proper grip by holding the pen or pencil between the index finger and thumb. The end of your writing weapon must rest well against the knuckle of the index finger or at the web of the hand. If you are holding your pencil too loosely or too tightly then this will result in poor handwriting. For the best writing, you must hold your bottom 1/3rd of the pencil for best results. If you are experiencing one common flaw in your handwriting then practicing it regularly and consistently will help you combat such errors and will maintain proper consistency between the shapes. You must remember that all the letters are prepared from circles, lines, and semi-circles. Also, you need to put some precise drawing techniques in order to craft such letters. So, begin practicing with your sheet by making parallel and vertical lines. Follow the same throughout the sheet and with different figures. You can practice making the same line again and again so that you develop a freestyle writing patterns with smooth curvatures and ends. Although everyone has his own unique habit, there is a specific way to write each letter of the alphabet. Make sure you follow writing in one, correct direction so that each letter is greatly enhanced. Following one single direction is an important step towards having a good handwriting. For example, if your writing in lowercase then you must begin with the alphabet in a way that is followed adequately. Also, practice writing every letter in the correct direction, which is almost similar to the way we were taught writing in the pre-school. By weapons, I mean that you must try writing with different types of pens and pencils. This might seem a little tricky to you, but different people are able to write better with varying utensils. Some varieties of utensils available are roll-on, ballpoint, gel pen, ink pen, and more others. Hence, if you practice writing with different writing weapons then this will help you discover your own unique and best way to write down in a way that showcases your writing in the best way. Fill up rows in each line with each letter of the alphabet in upper and lowercase. Use the font inspiration that you gather as well in order to focus on your handwriting on what you need to alter. If you experience a problem with slanting, make it a point to keep your letters verticals. If you wish to alter the shape of your letters then concentrate altering the shapes in various ways you see the inspiration, that you have selected. When you are close to perfection then practice writing them fully in words and sentences. You can write down small phrases on the initial basis over and over again in order to practice the letter again. This might seem a monotonous task, but practice makes the man perfect. This might seem a little tedious and troubling task but this is the key to achieve perfection and is necessary to smooth and easy out things. One gains precision only when you are able to write the words slowly. If you write the letters fast then you will not be able to gain precision for the letter formation. But slowing down the process will help you enhance the overall quality of your handwriting. Forming each letter deliberately and slowly will ensure that you gain precise skills for each word. If you think you are not able to learn properly what you are practicing to write, then create a rough outline and then rewrite it more slowly. If you wish to write your letters correctly, then you may use a template that can be traced well and can help you rethink to write the letters. You may search online for handwriting worksheets or templates that can be traced over the letters. This way you can practice writing yourself and develop a handwriting that is impressive and is not just close to perfection but is absolutely perfect. If you want to ensure that your letter and writing format is correct then all your letters must have the same height. In English writing, the lower case letters are half the length of the upper case letters. But there are few letters that may extend the top line, where there are others that may cross the bottom line. Hence, it is essential that you learn the precise way of writing each letter. Take advantage of online channels and search for videos that offer training in creating distinct letters. There are various videos on this subject. You can check videos in your preferred mode of writing. In addition to this, you can even follow any personality famous for writing on Instagram. The short videos from experts will help you learn the art of writing in the best way. There are various types of grips that people adopt in order to form letters and write. Lateral tripod, lateral quadruped, dynamic tripod, and Dynamic quadruped are the common form of grips. While there is no proven technique confirming that one grip is better than the other, the only way to improve your handwriting style is to write in a way, which is comfortable to you the most. The grip must place less strain on your joints and must help you to write smoothly. In order to improve your handwriting, it is essential that you follow all these ways properly. 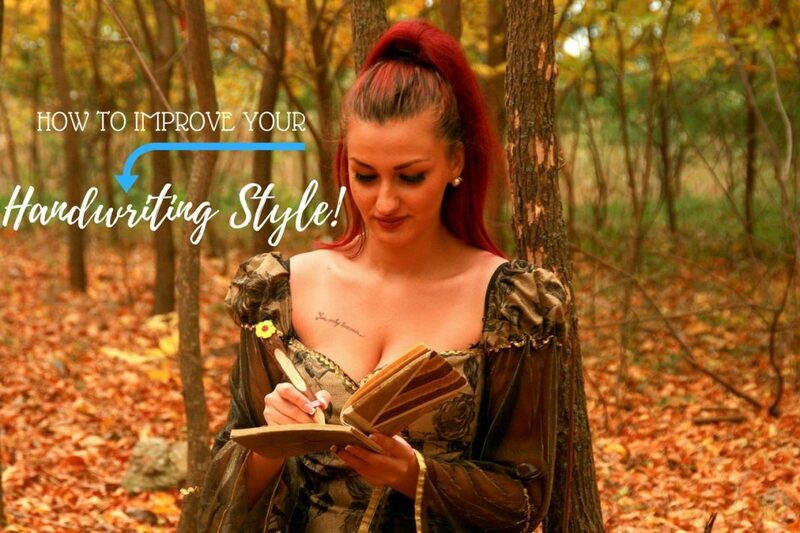 If you follow these ways on a regular basis then you will soon notice a difference in your handwriting style and will eventually develop a writing style that is just perfect!